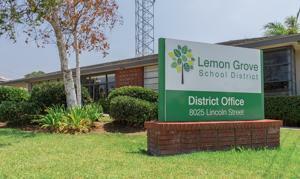 Lemon Grove School District is located in beautiful Lemon Grove, CA. We are an elementary school district serving approximately 4,000 students from Preschool through Middle School. Our school district was officially born on Mar. 18, 1893 when the San Diego County Board of Supervisors and Harry Wagner, County School Superintendent, approved the boundaries of the fledgling Lemon Grove district and separated it from the Hemet, Oak Grove, North Chollas, Spring Valley and Bloomdale school districts. The Lemon Grove Learner is diverse, unique, resilient, inquisitive, compassionate, and limitless. We believe that caring relationships based on integrity, honesty, and a respect for diversity are essential to learning. When our Lemon Grove Learners leave Lemon Grove School District they will know and be able to recognize their significance and potential, and they will use their 21st century learning experiences to thrive as tomorrow's leaders, workers and democratic citizens. Vision: Lemon Grove Learners are tomorrow’s leaders, workers, and citizens. The boundaries had been proposed by 11 Lemon Grove families with 16 children, ages five to 17. “We reside within the limits of the proposed district, and at a greater distance than two miles from any public schoolhouse; and that, by reason of remoteness from schools now established, our children are, in great measure, deprived of school facilities to which they are justly entitled." The 11 families, encouraged by the Lemon Grove Fruit Growers Association, which was simultaneously finalizing its own organization and bylaws, had begun lobbying for a school district in 1892. On Feb. 21, 1893 they had sent the required letter to the above school districts, informing them of their action. The families, anticipating success, had ceased transporting their children by wagon to distant schools and had already begun holding classes in fruit grower William Hurst’s large barn on Central Avenue near modern Corona Street. This bucolic, Horatio Alger style setting was short-lived from March to June 1893. 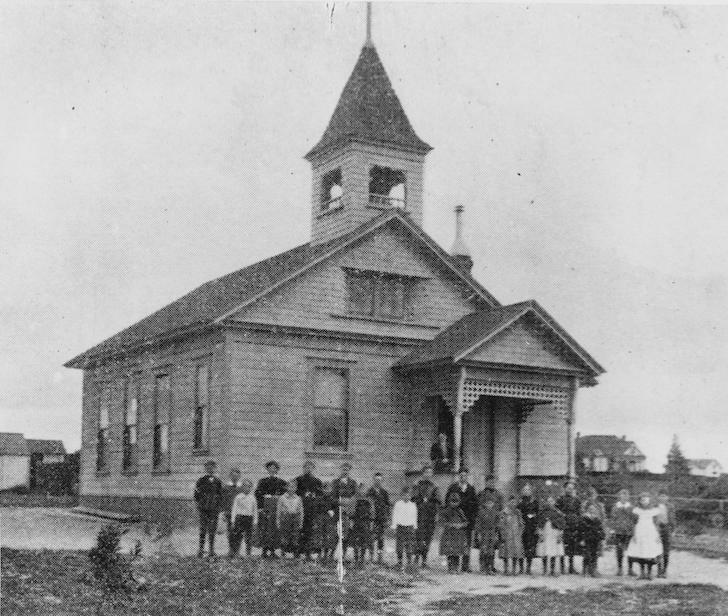 One-Room School: Over the summer of 1893 the town retrofitted a small house as a one-room school house, replete with bell tower, on land near the corner of Main Street and Central Avenue (see photograph above). School’s In: When the school year began just after Labor Day, 1893 Miss Ada Samples became the teacher of grades one to eight seated at wooden desks. Most of the children were in grades two to six, with a handful of tykes in grade one and a couple of rangy teenagers in the upper grades. School Wardrobe: Mostly homemade cotton dresses and pinafores, denim overalls and cotton, long- sleeve shirts, long socks and buttoned leather shoes comprised the garb of choice. Bonnets on the girls and straw hats on the boys to shield them from sun and dust were hung on hooks inside the school door and/or lost going to and from school. Old letters indicate that they were found and returned. Class photographs of the period show barefoot children- not because of poverty, but because they were ranch kids who ran barefoot to school and nobody minded. And all those shoe buttons took time to do up with one of Mama’s many button hooks. The girls usually managed this, but what self-respecting boy would do that if he could run barefoot through the orchards with pals? Mrs. Bell: By now many Lemon Grovians are familiar with the story of our school bell and how she was purchased in 1894 by the Lemon Grove Fruit Growers Association for $6.15 from Sears Roebuck’s catalog and shipped by rail for about $9 to arrive before the close of the 1893-94 school year for installation in that first little bell tower. Mrs. Bell rang in the 1893, 1908 and 1924 schools before her story took a dramatic turn in 1976. But she was rescued by the Lemon Grove Historical Society (thanks to members Harry and Barbara Towler) in 2002 and, today, hangs in the classic bell tower of our Mission Revival, joint use Lemon Grove Library, designed by Raul Diaz, on the campus of Lemon Grove Academy for the Sciences & Humanities. Frank Allison built the first house in Lemon Grove in 1891, a “small shack” on the corner of Imperial and Golden (site of modern Union Bank). He was the son of Robert Allison, whose fortuitous purchase in 1869 of the Santiago Argüello Mission Rancho lands led to the formation of Lemon Grove, La Mesa and part of Spring Valley and southeast San Diego. He built a flume to ensure a water supply for the future citrus orchards. George and Eliza C. Bates, fruit ranchers with a big orchard on the southwest corner of Central and Buena Vista Avenues. Lucena Elford (Mrs. Peter), a fruit rancher who also ran a laundry. Horace and Alta Fuller, fruit ranchers with land on Broadway west of New Jersey Avenue. George Hall, a fruit rancher and co-owner of San Diego Engraving Company. W. B. Ingraham, a fruit rancher on the northwest corner of Massachusetts Avenue and Grove Street (today, North Avenue). William Elvin Montgomery, a fruit rancher from Indiana, who later farmed in National City. S. L. Roberts, a fruit rancher on the northeast corner of Kempf and Lincoln Streets. John A. Wood, a fruit rancher who came here in 1880 as a water boy to serve the men building theCuyamaca Railroad. In other words, nine of the 11 families were directly involved in growing citrus and were instrumental in founding the Lemon Grove Fruit Growers Association, and building the town into an agricultural powerhouse. The famous Allison family lives on as Allison Avenue in La Mesa. Robert Allison did not live to see the fruits of his vision as he died in 1891 of several ailments. His wife, Tempa, may have named Lemon Grove. * Their sons, Frank and Joseph, built a flume for Lemon Grove and carried on their father’s investments in railroads and land. All of the families were Midwesterners, Congregationalists and Baptists, and independent minded. They were hands-on ranchers with only one or two who could be termed “gentlemen farmers” (Levi Geer and Col. Thomas J. Bryan). A significant number had asthma and sought the gentle climate of California in a period when allergies, colds and flu could result in sudden death. And so it went, dear readers, at the onset of summer, 1893 when a tiny crossroads became a town, a real place, thanks to the hopes and aspirations of a handful of Americans with dreams of growing far more than fruit. They raised up children who became teachers, lawyers, soldiers, ranchers, industrialists, nurses, doctors, business owners and so much more all those 125 years ago. *William Troxell, a rancher who built the third house in town (extant on Olive Street), is also credited with naming the town. The above, award-winning article was written by Helen Ofield for her former online column, “The Way We Were,” on Lemon Grove Patch.com. The photograph of Lemon Grove’s first grammar school is from the archives of the Lemon Grove Historical Society. Lemon Grove was incorporated as California’s 414th city in 1977. Now, approximately 26,000 people live in established neighborhoods including single-family homes, condominiums, and apartment buildings. Municipal parks provide recreational opportunities, and schools and churches are scattered throughout the city. Lemon Grove still exhibits community pride and spirit in our modern era, boasting about having the "Best Climate on Earth", its motto for more than 100 years. Centrally located in the southwest portion of San Diego County, Lemon Grove is only nine miles from downtown San Diego, and only 12 miles from the airport.